As an indie author, you'll find plenty of people and companies that would happily try to part you from your money, all in the name of book marketing or publicity. But, again as an indie, you might have a limited book marketing budget to work with. So where should you spend it? This topic came up here previously, starting off with a discussion about writing contests, but later the topic of paid book review services came up. It's no secret that I dislike paid book reviews, and I've posted previously about some of the risks in buying reviews. So I suggested that there were likely better places self published authors could spend their money. Today I'd like to share some examples with you -- where you should spend your book marketing budget (as in which tactics and tools to prioritize). Keep in mind that these come after your book is written and edited. I strongly recommend hiring professional editors in addition to having a marketing budget. Your book cover design is your book's packaging -- a vital element of any author's marketing mix. You can't afford to slap a crappy cover on your book before sending it to print. And with the way books and e-books are often browsed online these days, it's extremely important that your cover sets the right tone and leaves the right impression. If you have only one thing you can spend money on when marketing your book, get the best, most market-appropriate, cover design you can afford. Your author website is like your home base on the web. It's where readers can find out how to contact you. It's where you can build your fan base with your author blog, excerpts, and other reader benefits. And it is, or it should be, one of your top book marketing tools. I know some indie authors think it's enough to have a profile on Amazon that they can link to. It's not. If I can tell you anything from my years in PR and online marketing it's this: relying exclusively on third parties is never a good idea. That's not to say you shouldn't use third party profiles and sales platforms. But don't spend years putting all of your marketing efforts into promoting someone else's site or platform. Prioritize your own site and turn it into a central hub for your online promotional activities. How can you spend your book marketing budget here? Get a self-hosted website or blog. Pay for hosting. Pay for a strong theme or template, or hire a professional designer. And if you aren't in a position to maintain a site on your own, consider hiring someone to serve as webmaster to handle your technical issues for you. A professional author website doesn't have to cost a lot. But if you're really concerned about it being "professional," it also won't come for free. Every author should have their own email marketing list. Every author. Your email list is your most direct line of communication between you and your readers. When someone signs up, they've invited you into their inbox -- something many check at least once each day. If you have a message that you want to get in front of those fans, their inboxes are where you want to be. You don't have to spend a lot to run a successful mailing list. But you'll need to work with a reputable email marketing service (such as MailChimp or Aweber). It's as much about protecting yourself as making it easier to manage subscribers. In one of the posts I wrote about paying for book reviews, a commenter chimed in complaining that, among other things, they'd paid around $15,000 to a PR firm. And they had little to show for it. They followed up privately and we had a great conversation about this and other things (and as it turned out, they used a firm I was familiar with from my own days running a PR firm specializing in helping creative folks). As soon as I heard what PR firm this author had hired, I knew where their problem was. The firm was a terrible fit. They were more "entertainment publicists" than actual PR reps (book PR and book publicity are not the same thing). And they focused more on music and TV promotions than services related to authors. It's easy to toss a lot of money at some comprehensive package with a firm. But no package deal is going to be perfect for every client. Instead, if you want to spend money on professional help, especially for your first book, hire pros on a project-by-project basis. For example, hire a real PR professional to draft your launch press release for your media kit (and pay them for distribution if they have relevant industry contacts and you don't have your own media list yet). Hire a professional copywriter to write the back cover copy for your book. Writing a book and writing marketing copy are two very different things. Not all authors are competent copywriters. I'd argue that very few actually are. Yet that copy is some of the first information potential buyers will read about your book. improve your site's search engine optimization. Unless you have experience in these areas and can do them yourself (given that you know your book better than anyone else), don't rely on a single pro or firm to do all of this for you. You would be hard-pressed to find someone with expertise in all of these areas. As a result, you'll end up spending money on less than stellar campaigns. I'm not saying you shouldn't hire PR firms or publicists. You will need help at times if you want to maximize your book sales and audience reach. But you should go into these relationships knowing exactly what you want to get out of them. These are some of the biggest areas where you might spend your book marketing budget, depending on your individual needs. 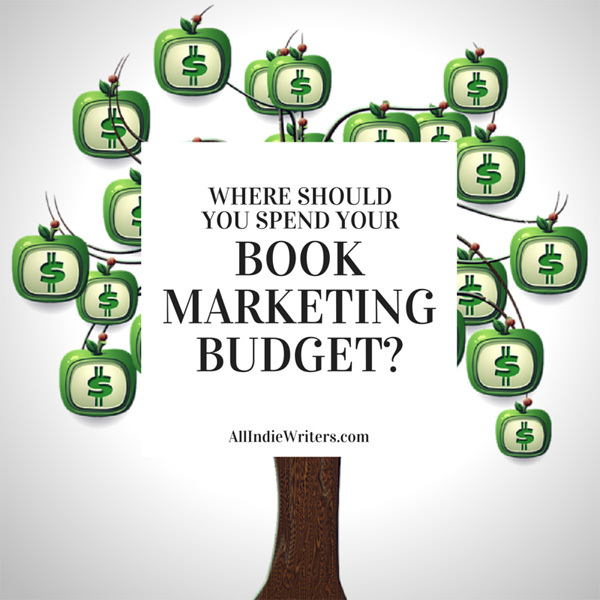 If you've already run book marketing campaigns, what did you spend the most on? How would you allocate your budget differently the next time around? Share your thoughts and experiences in the comments. I love these points! I’m curious what kind of money you suggest putting into your email list aside from just the service you use. Would you use other types of marketing tactics to get people to sign up to your newsletter? – paying for ads, promoted tweets, etc. to promote the newsletter. Those are some of the more common expenses that come to mind. You don’t need to do all of these things. But the less an author knows about design and email copywriting, the more help they should seek, even if just with their initial setup. And the bigger an author’s existing audience, the less they’ll probably need to do to build their list.